Have a question about Maine potatoes, or potatoes in general? Check out our FAQs! If you don’t find what you’re looking for, please contact us and we’d be happy to answer any questions you might have. How many acres does the average potato producer grow? In the United States, commercial growers average between 500-1000 acres. How are all of the potatoes used? In 2002, the United States produced over 46 billion pounds of potatoes from the 1.31 million acres that were planted. Of the 46 billion pounds, approximately 34% were processed into frozen potato products, such as frozen fries, tater tots, hash browns, and home fries. Another 28% were supplied to the fresh market, including retail outlets and food service, for uses such as baking, mashing, roasting, and boiling. Special varieties of potatoes are grown specifically for the potato chip market, with chipping potatoes accounting for 12% of all potato production. Dehydrated potatoes—used for products such as mashed potatoes, extruded chips, potato pancake mix, starch, and flour—account for another 10% of production. The remaining 16% of the potatoes grown in the U.S. are used for livestock feed, potato seed, or on farm consumption. 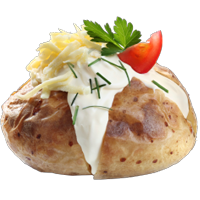 Potatoes are a popular food. The potato is the second most consumed food in the United States. An average American eats 135 pounds of potatoes a year, which is equal to about a one potato per day average. What’s the difference between starchy and waxy potatoes? 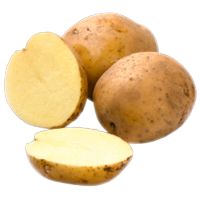 Starchy potatoes have low moisture and sugar levels, but a high starch content. This makes them the better potato for baked, mashed, fried, or roasted potatoes. With the low sugar content they collapse better. 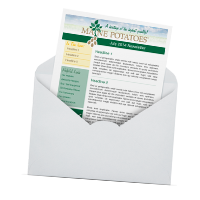 Waxy potatoes are just the opposite, with high moisture levels and low starch levels. They are good candidates for salads or casseroles because they hold their shape well when cooking. Why do some potatoes become discolored after they are cooked? Potatoes may turn a darker or black color after cooking. This will happen if the potatoes are old or have been in a cold environment, such as from exposure to frost or being in a refrigerator. You can prevent this problem by storing them in a warmer environment or when cooking you can add a little lemon juice or vinegar to the water you boil them in. Why do potatoes grow sprouts? When potatoes are in temperatures that are too warm they begin to develop sprouts. This means that the potato is trying to grow. Remember to cut away the sprouts before eating the potato. Storing the potatoes in a cool, dry, and dark location will help prevent this. How do you prepare a potato? Make sure to thoroughly wash the potato and cut away green discoloration and/or sprouts. Potatoes can be eaten raw or cooked. You can enjoy your potato with the skin on, or peel it to make other tasty dishes. How should potatoes be stored? They should be stored in a cool, dry environment with good ventilation. Paper bags, cardboard boxes, and pantries are good places to store them. An ideal temperature for storage would be between 45 and 55 degrees Fahrenheit. Avoid storing them in plastic bags or in refrigerators and make sure the environment is not too warm. 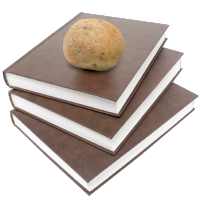 Are potatoes a nutritious food? Yes, of course they are. Potatoes by themselves contain no fat or cholesterol. The average size potato contains only about 100 calories and it is about 80 percent water. Potatoes contain 45 percent of your daily recommended vitamin C and 21 percent of your daily Potassium. Potatoes also contain vitamin B6, fiber, and antioxidants (which have shown to reduce the risk of cancer). The skin of the potato is where you can find most of the fiber, with many nutrients located close to the skin. For more info, explore our Nutrition page! How do you select the perfect potato? When looking for a good potato you want to make sure that it is well formed, smooth, and firm. There should not be any discoloration, cracks or soft spots. Potatoes grow best in areas with nutrient rich soil, ample rainfall or irrigation, along with warm days and cool nights. Nearly 90% of potatoes are planted in the spring after the final frost of the season and harvested in the fall. Potatoes harvested in the winter, spring and summer account for the remaining 10% of production and fill special market needs, such as supplementing the fresh supply or to ensure adequate supply for processing. Potatoes are planted using seed potatoes, grown specifically for the reproduction of potatoes. Generally seed potatoes are cut so that each planted piece has one to two eyes. In most cases, certified seed is used when planting. Certified seed potatoes undergo inspections throughout the growing season by state certification agencies to guarantee that strict tolerances for diseases are adhered to. 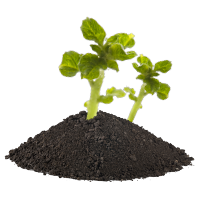 Potatoes are susceptible to a number of pests and viruses; and the use of certified seed ensures a disease free seed and provides higher yields. Seed potatoes are planted approximately 12 inches apart and approximately 4 to 6 inches deep in rows that are between 2½ and 3 feet apart. A hill is formed for each row of potatoes so that the soil forms mounds around the plant, which helps to protect new tubers from the sun. Potatoes are 80% water; therefore, good soil moisture is key in all stages of growth. As the growing season progresses, leaves will develop above ground and roots will develop under ground. The roots absorb the nutrients in the soil, and the leaves absorb sunlight that is converted into energy for tuber-growth and also protect the hill from direct sunlight. As the growing season comes to an end the branches will begin to lose their color and wilt, this is a sign that the tuber skins are setting and they will soon be ready for harvest. In the U.S., western states account for approximately 65% of production, central states account for 25%, and eastern and southern states account for the remaining 10%. With 90% of all potatoes being harvested in the fall, a majority of the crop is not sold immediately but rather stored and sold throughout the remainder of the year. Potatoes have the physical characteristics that make them ideal for long term storage in specialized sheds. As a result consumers have access to high quality potatoes year-round.